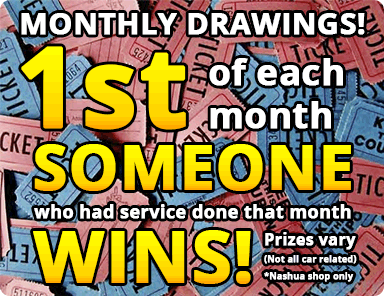 Merrimack Auto Center is pleased to welcome new Milford customers and proud to serve the Milford, NH community. We are dedicated to being a good neighbor and trusted business in Milford, NH, so you can count on the Merrimack Auto Center team for an honest evaluation, quality products, superb service, and a fair price. You'll find the most trusted tire brands at Merrimack Auto Center including Bridgestone, Firestone, Michelin, BF Goodrich, Carlisle, General, Hankook, Pirelli, Uniroyal, Continental, Cooper Tires, Dunlop, Falken, Goodyear, Kelly Tires, Kumho Tires, Mastercraft Tires, Yokohama, Peerless, Tire Co. and Toyo. The Merrimack Auto Center team takes the stress out of tire shopping in Milford, NH with great service, along with experienced and knowledgeable assistance. Merrimack Auto Center also provides a full range of auto repair services, meeting the automotive repair and maintenance needs of Milford drivers. The professionals at Merrimack Auto Center are expertly trained and experienced in working with a wide variety of vehicles. Merrimack Auto Center ready to serve Milford, NH drivers with the services you need, to get you back on the road in no time. Your Miford neighbors trust Merrimack Auto Center as their source for tire and automotive needs. If you are looking for a trusted tire and auto service source in Milford, NH, contact us to schedule an appointment with Merrimack Auto Center!